In a career defined by mind-bending saves and rabbit-out-of-a-hat rescues, Nolan Aylward's senior season came down to a single decision. 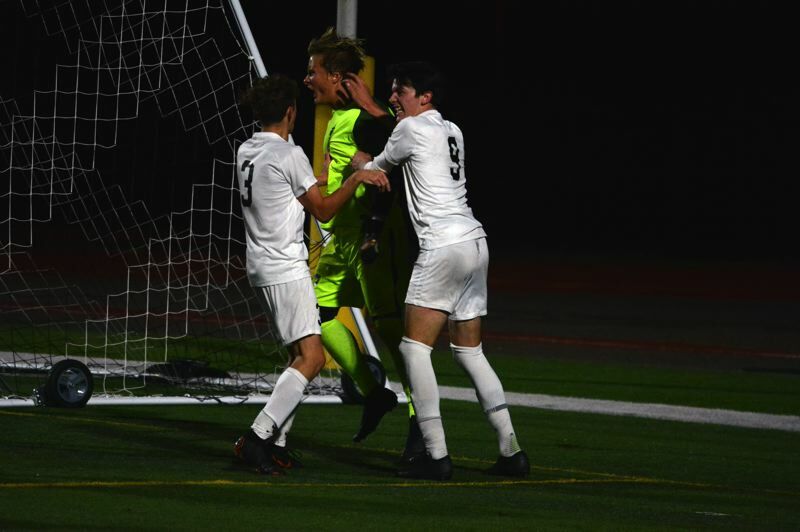 With Jesuit clinging to a 2-1 lead in overtime against Forest Grove in the Class 6A boys soccer semifinals, the Crusaders were called for a handball in the box with 2 minutes and 14 seconds left in the second overtime period. 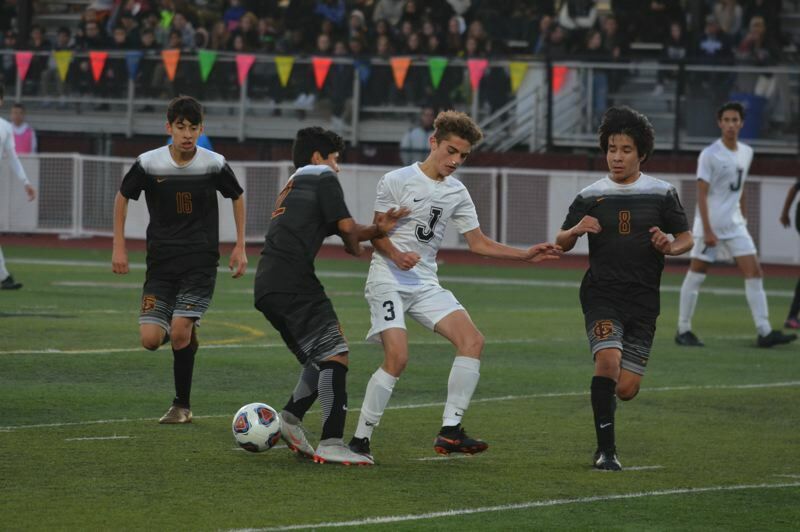 The infraction gave Forest Grove for an automatic penalty kick, a Russian Roulette-like game of chance between Oscar Macias and Aylward — the fearless last line of defense who's been through the fire the past four seasons as Jesuit's starting keeper. The capacity crowd quieted as Aylward slowly clapped his hands together in a crouch in the center of the goal, not giving Macias a hint of which way he was leaning. Macias took a deep breath, took two strides to the ball and soon as his toe made contact, Aylward laid out to his left. Macias went low and right and Aylward was right there to knock it out. The rebound attempt by Juan Romero Guerrero was online and open, but it went way wide of the frame. 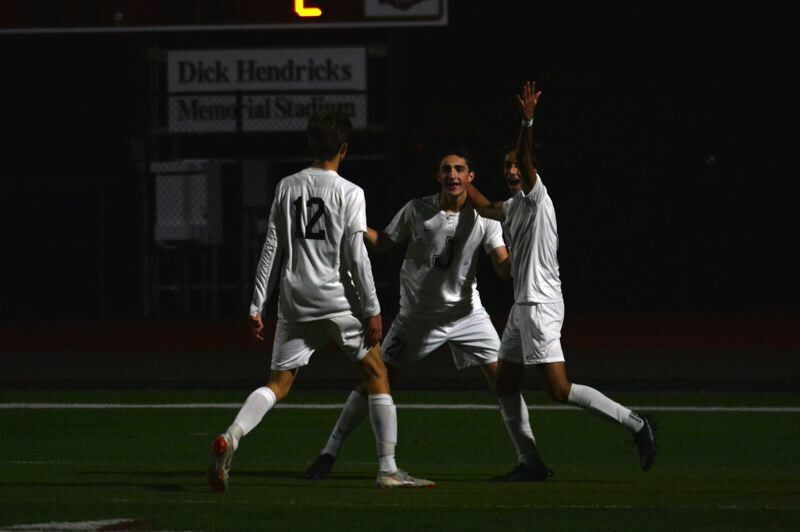 Two minutes later, Jesuit, clinched the 2-1 semifinal win over Forest Grove at Forest Grove High School on Nov. 8. The Crusaders will play Summit at 3:30 p.m. on Saturday at Hillsboro Stadium. Aylward guessed correctly and now the Crusaders are going back to the state title game for the second straight year. Before every game Aylward and backup goalie Nolan Gregg go over the game plan and strategize how to approach penalty kicks, should a match come down to such a circumstance. Aylward wouldn't reveal the goalies' plot, but simply said he needed to come up clutch in a crucial moment. "It wasn't the most spectacular save I've had in my life, but it was definitely the most important," Aylward said. "That's one you'll remember for years to come, until my older days when I'm done playing soccer. As a senior, I didn't want this to be my last game. No matter what happens in the final, we made it there and I love my team. That's all that matters." Jesuit junior Remington Grayson, who tied the game in the second half by finishing a loose ball off a corner kick, gave the Crusaders the lead for good in the first overtime. Situated on the right side of the pitch, Grayson made his way into the box as the Crusaders flipped possession and flooded the final third with three attackers. 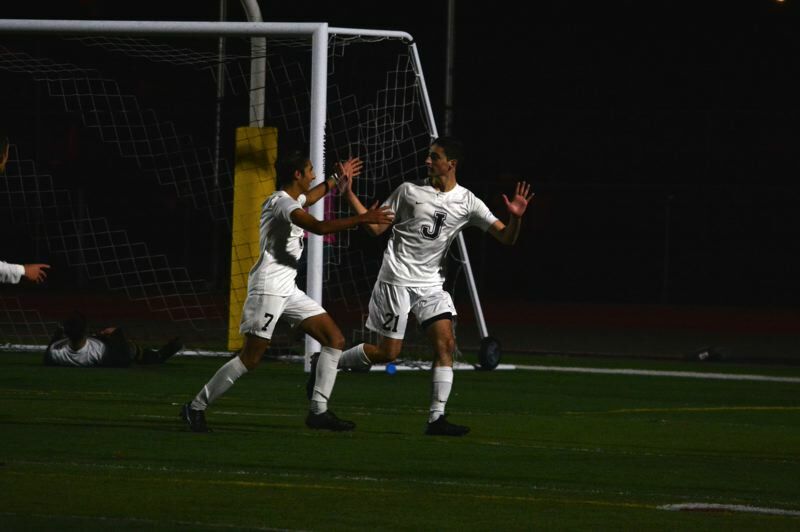 Devin Slingsby seared a 40-yard pass across the pitch, over the head of a leaping Viking defender to an improbably uncovered Grayson who chipped the ball through the charging Viking keeper's legs into the uncovered net to go up 2-1. "Keepers have fast reactions, but their brains don't move that fast," Remington said. "If you hit it quick enough, you'll score. I just had to hit it and I knew it'd go in." Jesuit trailed 1-0 at the half against the Vikings after Forest Grove got off four shots on goal and had the Crusaders on their heels more most of the first 40 minutes. The jam-packed, full-throated Forest Grove crowd was loud, proud, and fully behind their Vikings all match-long. But the momentum shifted completely as Jesuit monopolized possession and slowed Forest Grove's normally speedy kick-it-deep-and-go offensive game. Grayson scored the equalizer with 30:53 left in the second half when the ball came out of a cluster of Vikings and Crusaders off a corner kick and found the forward a few yards from the frame. Defensively, credit the Crusaders' backline. Jack Chestnutt, Aiden Azavedo and Oscar Baudey and others not only kept the dangerous Macias away from the goal but helped press the ball back at the Viking defense and kept it under Crusader control. "If you let a team like Forest Grove play their style of soccer, they're really great," Aylward said. "They get the ball in the center and try to play it deep. But when we were able to disrupt that, that's when we were able to get the momentum. And we played our game and got it moving to the wide areas of the field." In a 30-second span in the second overtime, Jesuit was given a red card when a player was ejected for arguing with an official. On the ensuing free Jesuit was burned by the hand ball in the box that set up the penalty kick. But to the Crusaders, being backed into a corner is nothing new this year. Jesuit's uneven non-league slate and a 4-1-1 record in the Metro League left the Crusaders with the No. 12 seed in the 6A playoffs. Other than its first-round opener against Bend, Jesuit's been on the road all postseason-long. Each playoff match has been decided by a goal. Even beating Grant in the quarters required penalty kicks. It hasn't been as easy a road to get to the title bout as it once was for Jesuit, but it's been equally rewarding if not more so than in years' past. "It's a testament to our ability to go all out and play like we have nothing to lose because at this point we don't," Aylward said. "It's hard to come back from essentially in our point of view is a losing season compared to last year. To come back from that and get into the finals shows great character from this team." It will be Grayson's first state final of his career, a game he's watched many a time but never been a participant in. It sounds cliché, but the Crusaders are peaking when it matters most. Grayson said the group is playing as one more now than at any point in the season. They're rowing in the same direction, toward the same destination. "I'm beyond excited," Grayson said with a smile. "We've worked so hard this season. We've had our ups and downs. To finally work together as a team is the best feeling. Our coach told us we're great individuals, but we had to work together to win this. We wanted to show all these other teams that we were meant to be in the finals. We're here to win it all."